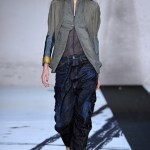 The female G-Star Raw collection showed closely connected navy and black leather dresses and a new wider cropped jean. I suppose this is G-Star‘s version of the flare. The denim brand introduced a new silhouette with their elegant, padded Jade Skirt which features an extreme knee shaped silhouette due to high tech tailoring. It was combined with a waxed finish utility Selwyn Vest. The wash was inspired by early North Sea fishermen, who would rub linseed oil into their smocks for waterproofing and windproofing. The newest line was widely appreciated by a largely crowded, mostly standing (and probably over invited) group of fashion savvy viewers. 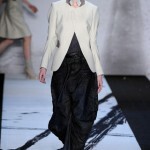 I would say the show was widely a success as the frills were taken away and the clothing was the center of attention.